Get a discounted shipping price if you order a screen door for our new year celebration. Call or email us for details. 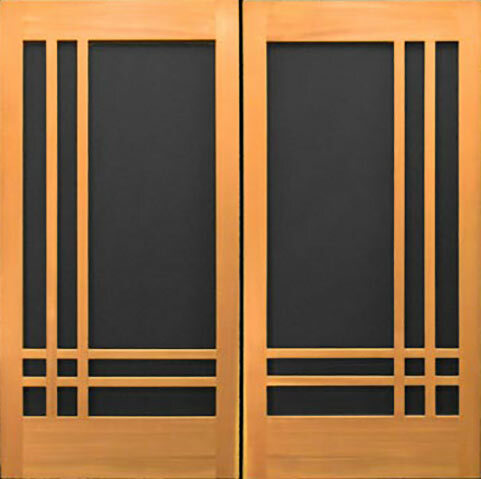 The Craftsman two Design of our Craftsman cedar wood screen door collection is one of our more artistic and sophisticated designs. The C-2 creates a unique and architecturally pleasing entrance to your home or structure. All of our Craftsman doors are built using select Vertical grain cedar. Our Material is carefully selected from our artisan craftsman and then carefully handcrafted to create a balanced one of a kind piece of art! Purchase of a screen door includes Deltana Hinge set !